A midst the mountain valleys, with rains pouring on our tents, cool temperatures outside and soft beds with thick blankets inside. Heavenly experience !! Sight of Kumar standing on the other end of the bridge waving at us. We could sense his fear and excitement as he crossed the bridge. Kumar completed his Canyon swing in the morning, and later in the day we did the 120m canyoning. 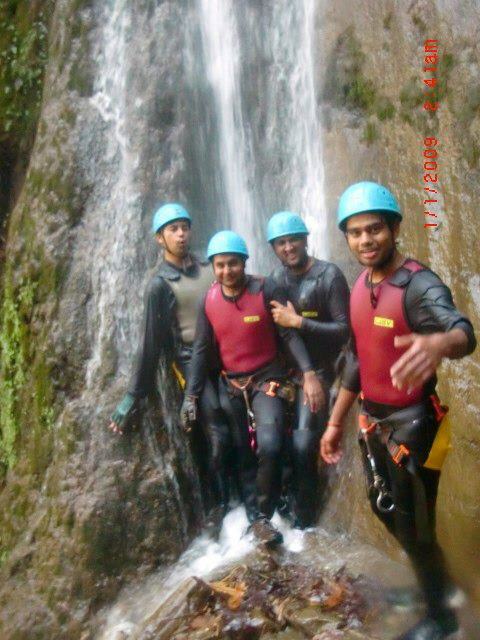 Canyoning again was fun, which included abseiling, jumping and sliding down steep canyon walls. The rocks were slippery and waters were cold as we abseiled down five waterfalls. It was a grueling 4 hours of abseiling and at the end of it, we were all super tired . We got off the bus at Kodari Tatopani. Tatopani means hot water springs in Nepali. We booked a hotel which was right next to Tatopani. In the morning we hired a taxi for 1000 Nepali rupee to take us till Friendship bridge (Nepal-Tibet border) and back to TLR. We crossed across the Friendship Bridge border line and stepped right into Tibet, just for a few seconds though. Back in TLR, we started our White water river rafting on the Bhote Koshi river. It was again an awesome experience, rafting lasted for more than 4 or 5 hours. The best part was when we were asked to jump into the cold rivers from a rock which was almost 2 floors high. It was again quite a bit of Adrenaline. We were dropped off at Thamel in the evening, and we checked back into our good old Hotel Backyard. Today happened to be Nepali Calendar year 2069 new year’s eve. We strolled on the Thamel roads late night, and spent some time at a local Hookah joint. 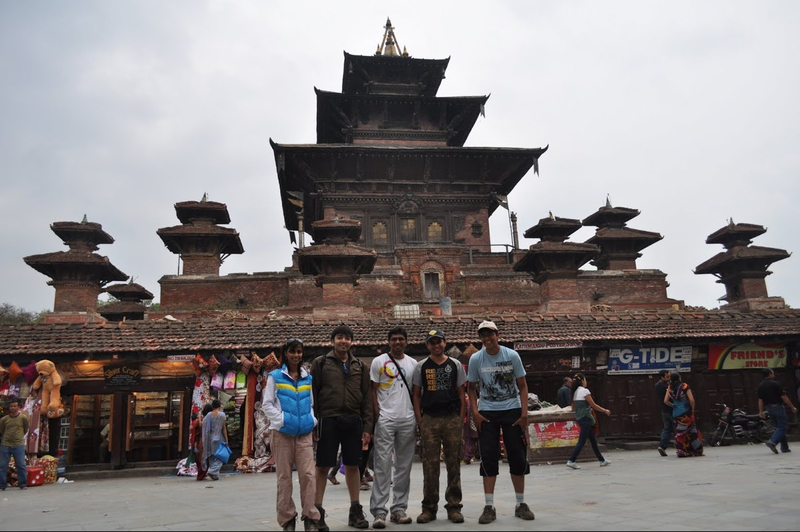 Today we went to Pathan Durbar square, and also visited an ancient Budda Temple. Later in the day we visited the famous Pashupathinath temple. A phenomena – Just before we reached the temple, we were travelling in a bus and a person sitting next to us told us, we should do abhishek to a Shivling at Pashupathinath during which, if we were lucky enough, the priest would present us a Rudraksh maala. We just said an OK, and almost forgot about it. When we reached temple at 4, it was closed. As we walked in the temple premises, a person from no where came to us and asked us to follow him. He opened the temple doors, and made us do abhishek to Shivling. Shivling had three Rudraksh maala on it. After abhisheka, the priest took the maala from Shivling and made the three of us wear it. And when we came out of the temple, he closed the doors and left. The three of us were just awestruck, we couldn’t figure out what just happened!!! 8PM: @Thamel – Typical Shaz just walked into an ATM and came out with 10,000 rupee cash. We knew almost all shops closes at 9.30/10, we had an hour more to spend off all the money. We split up n shopped in hurry. At 10 PM, mission accomplished, hands full of shopping bags and we had not even a penny left with us. Bye bye Kathmandu, we reached Delhi by noon. We went straight to Delhi 6, and belted moth watering chats and sweets.. It was very much part of the plan, to spend a day in Delhi hogging. Back in Bangalore late in the evening, yet another successful, trip comes to an end. But a bit of an anti-climax in the end, when I claimed by baggage in Bangalore, I got to know that my Black Label bottle (Bharath’s bachelors party gift) was broken into pieces. :(. No worries.. a super successful trip comes to an end .. I was fighting enemies, exploring Kathmandu, trying to find Shambala on remote peaks of Nepal (Playing Unchartered 2 on my PS3 :P). Buzzzz..I got a mail from Karthik, he’d shared this video http://www.youtube.com/watch?v=Lz4qIzkwr1A. I watched this video over and over again. And in the end, I was like- Okay, there’s no way I’m missing this trip. I called up Karthik and thus the trip plans took off. Within a week’s time Shaz and me booked tickets to Kathmandu. Just a few days before our trip, I shared the same video with Kumar, I assume ditto happened, the video was so very tempting, Kumar couldn’t resist, he too booked his tickets to Kathmandu. So the final gang – Karthik Ramesh, Ramya GN, Shreyas, Raghu, Karthik Nischal and me. Kumar would join us half way in the trip. A week before we took off, we used to plan and talk lots during our late night conf calls. Alll of us discussed and chalked out plans and all, well almost all of us except me :D, coz I kept missing these overnight conferences calls. The trip takes off- I was picked up at 7 am in an Innova right from my door steps, How convenient 🙂 !!,,.. I slept almost all the way till airport, nice early morning nap it was. Pic- At BIAL, as we get set to take off..
Just before we landed in Kathmandu, the views outside the airplane were breathtaking, beautiful Kathmandu valleys, lush greenery with tiny houses on mountain tops. We walked out of our planes into soothing weathers outside. Airport looked like a vintage college hostel with brick walls and so little crowd. It was as if like we time traveled back to the good old 1980s. Our hotel pickup cab was waiting for us outside the airport, with a banner wishing birthday to Ramya. (April 6th happened to be Ramya’s birthday 🙂 Later in the evening we had a small birthday cake cut/ celebrations back in our Hotel (Hotel Backyard, a nice hotel in the heart of Thamel). After all the birhtday celebrations, we strolled around in one of the most happening place of Kathmandu, ‘Thamel’. We started our trek from Sundari Jal, it was a little crowded during the first 2 hours of trail, but eventually deserted out. Trails were a bit steep. It was a bit too tiring for the few of us, so we later detoured towards flatter roads. I was lucky enough to see a Black Panther in the forests near Chisapani. By the time we reached Chisapani, it was dark, maybe around 8PM. The temperatures were around 7/8 deg C, we had a hearty dinner at Chisapani and the accommodation there was decent too. Trekked from Chisapani till Nagarkot. We even had to trek a bit in rains for a while. Another nice little fun moment was the ride atop a mud laden truck. After a 10 hour tiring trek, we reached Hotel Mountain View, easily the best hotel in Nagarkot in the evening. If you’re honeymooning, this hotel’s just perfect :P.
We were woken up by hotel staff in the early morning, they even asked us to get ready soon and reach roof by 6 AM. 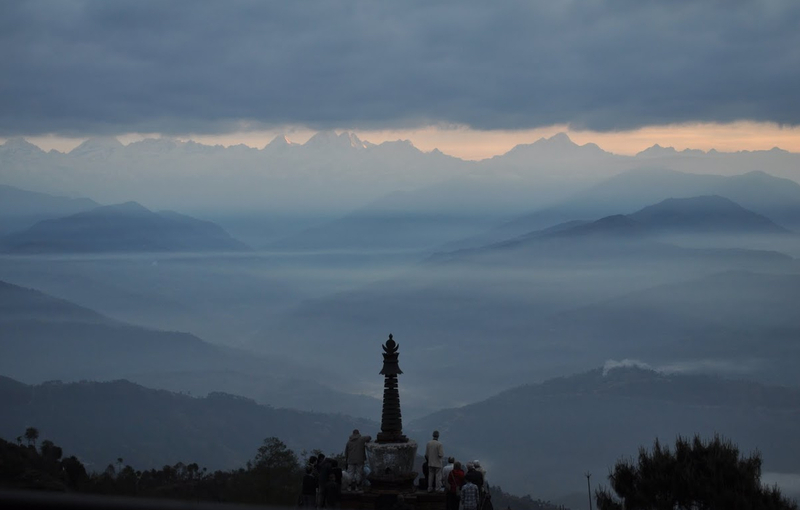 Views of the sunrise along Langtang range from Nagarkot was breath taking. Kathmandu saw a partial strike today, but we were able to hire a bus at Nagarkot, and reached Kathmandu sometime in the afternoon. We booked The Last Resort Tickets, and walked around in Durbar Square in the evening. In the night there was a huge thunder storm, but we safely slept in our hotels. It was a 3.5 hour drive along the curvy valleys to the Last Resort. I couldn’t stop thinking about the jump and all the way. My mind was acting as if like a virus infected Celeron powered PC..Pheww!! The first sight of the suspended bridge (from where we jump off), made my heart pound louder, crossing the bridge and reaching the other side was scary enough..
After all the briefing, registrations and all, in an hours time, the 5 of us were on the bridge waiting for our turns..
Ramya, Karthik Nischal and Crazy Shaz jumped b4 me, Shaz even filmed his jump with his camera along!!! My turn – The real kick is when you stand on the edge, with 1/4th of our feet facing below. 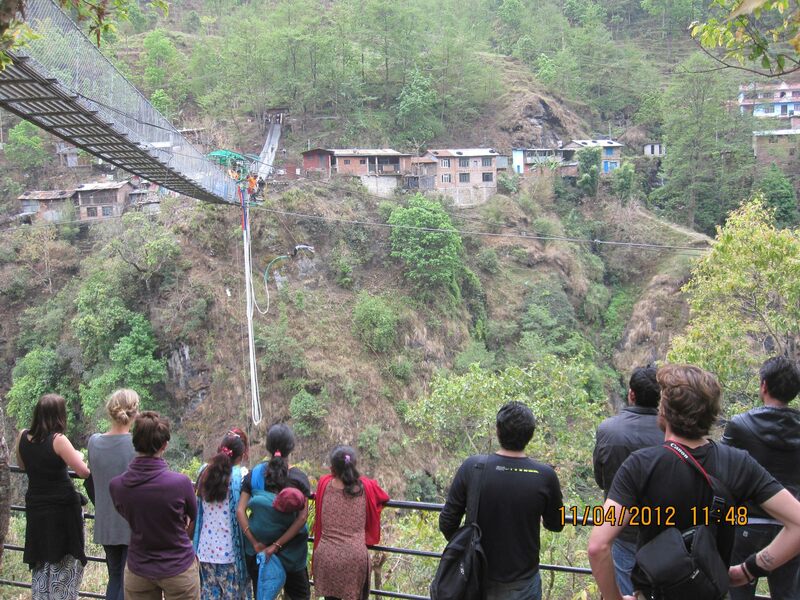 And then wooshhh… ADRENALINE, FREE FALL INTO THE HIMALAYAN 160 METER DEEP GORGE!!! This ones not just another swing, its the biggest Canyon swing in the world, phew… what an experience, this is gonna be my shortest few seconds of my life about which Im gonna be talking for the rest of my life’. Later int the resort we saw our videos, had nice lunch and then adieu to Karthik, Karthik Nischal, Raghu n Ramya. Shaz and me stayed back and strolled around at the last resort. We had a conversation with BungeeMaster while we had food, a night walk on the bridge..